When we think about marine aquaria, we often think about light. And lots of it. To satisfy the needs of their precious corals, aquarists ensure their tanks are well lit by powerful lamps. Most people realize this is mostly for the benefit of the so-called zooxanthellae, which grow inside coral polyps. But what are zooxanthellae exactly? First, let’s have a look at their name. The term zooxanthellae stems from the Greek zoon, or animal, and xanth, meaning yellow or golden. In other words, they are gold-colored cells that grow in animals. The name zooxanthella (singular) was first coined by Brandt in 1881. Zooxanthellae are found in many coral species, spanning countless genera and families. From top to bottom: Fungia sp. (Fungiidae), Caulastraea sp. (now a member of the Merulinidae) and Trachyphyllia geoffroyi (Trachyphylliidae). At present, it is clear that zooxanthellae are not true algae, but rather members of the phylum Dinoflagellata (from the Greek word dinos, for whirling, and the Latin word flagellum, for whip). The phylum Dinoflagellata forms a very large group of unicellular organisms, most of which are classified as marine plankton. Some live in a symbiotic relationship with animals, such as corals. This includes dinoflagellates from the genus Symbiodinium, which are found in the tissues of the phyla Mollusca (Tridacna clams, nudibranchs), Platyhelminthes (flatworms), Porifera (sponges), Protozoa (foraminifera), and Cnidaria (corals, sea anemones, hydroids, jellyfish) (Stat et al. 2006; Venn et al. 2008). Symbiodinium spp. possess an important trait, namely the ability to photosynthesize. Photosynthesis is the conversion of inorganic carbon dioxide to organic compounds, such as glycerol and glucose, by using the energy from (sun)light. Corals harboring Symbiodinium require light to grow properly, as the nutrients produced by photosynthesis not only sustain the zooxanthellae, but also fuel the energy-demanding process of calcification (skeleton buildup) in corals. The importance of the animal-dinoflagellate symbiosis to the success of coral reefs is profound; the appearance of reefs in the Triassic period (250-200 million years ago) is thought to be a direct result of the evolution of this symbiosis (Muscatine et al. 2005). When Symbiodinium live freely in the ocean, they exist in two interchangeable forms (Freudenthal 1962). The first is a motile zoospore, which propels itself forward with a flagellum. The second form is a vegetative cyst, and is not motile as it lacks a flagellum. Vegetative cysts can reproduce asexually, when they are free-living or in symbiosis, by cell division that yields two or three daughter cells. There are indications that Symbiodinium spp. can also reproduce sexually (Stat et al. 2006). The vegetative cyst is the dominant form when dinoflagellates live in symbiosis with animals, and evidence suggests that the animal host uses chemical signaling to keep them in this non-motile state (Koike et al. 2004). In most cases of symbiosis, zooxanthellae live inside an animal host cell, bounded by an animal membrane, known as the symbiosomal membrane (Venn et al. 2008). In Tridacnid clams, however, zooxanthellae live extracellularly, in between the clam’s own cells (Ishikura et al. 1999). In corals, the zooxanthellae reside in the gastroderm, the cell layer which covers the coelenteron, or stomach of the polyps. 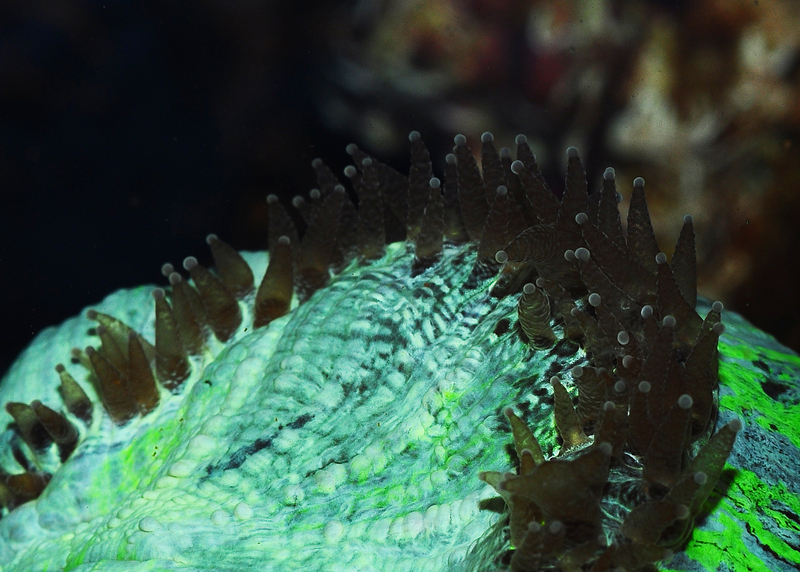 In recent years, the mechanisms underlying the onset of the coral-zooxanthellae symbiosis have been studied in the lab. Currently, scientists have divided the symbiosis between cnidarians and algae into six phases; initial contact, engulfment, sorting, proliferation, stability, and finally dysfunction (Davy et al. 2012). First, free-living zooxanthellae have to encounter potential hosts such as corals. Although some coral species transfer their zooxanthellae to their offspring via eggs, a process called vertical transmission, many species need to acquire new symbionts every generation. 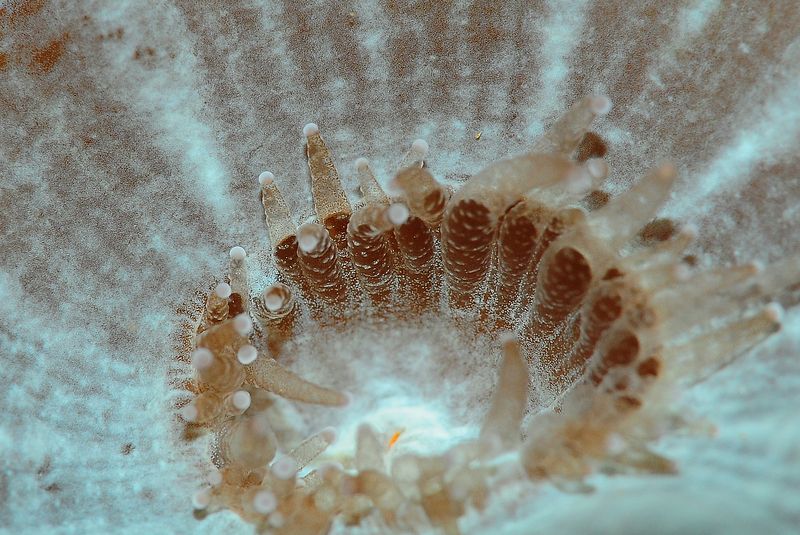 Coral larvae and polyps do so by taking them up from the water column, which is called horizontal transmission. The recognition of zooxanthellae as potential symbionts by corals is not completely understood, but it requires a myriad of signaling molecules present on the cell surface of both partners. After the coral’s cells have successfully recognized potentially compatible zooxanthellae, the cells engulf them through a process called phagocytosis (from Greek phagein, or to devour, kytos, or cell, and osis, meaning process). Next, a sorting process commences, leading to digestion of unwanted zooxanthellae, and persistence of others. The coral’s preference for a specific zooxanthellae type, or clade, depends on many factors, including species. When a coral encounters incompatible zooxanthellae, an immune response is triggered, and the dinoflagellates destroyed and expelled. Suitable zooxanthellae will proliferate throughout the coral’s gastroderm, and a stable symbiosis will ensue. Once a stable symbiosis is established, the zooxanthellae and coral are able to mutually benefit from the collaboration by exchanging nutrients (also see below). However, when the coral is stressed, by elevated water temperatures or high light intensity for example, a phenomenon known as coral bleaching can occur. This is caused by dysfunction of the symbiosis, the sixth and last known phase. Dysfunction during heat or light stress is thought to occur due to damage sustained by the photosynthetic machinery (or photosystems) of the zooxanthellae, which causes toxic molecules to flow into the coral’s tissue (Venn et al. 2008). These toxic molecules are so-called reactive oxygen species, and they include superoxide radicals (O2–) and hydrogen peroxide (H2O2). As a response to these toxins, the zooxanthellae are probably destroyed by and ejected from the gastrodermal cells, and next through the mouth of the coral. Overview of the six known phases of the cnidarian-algal symbiosis. 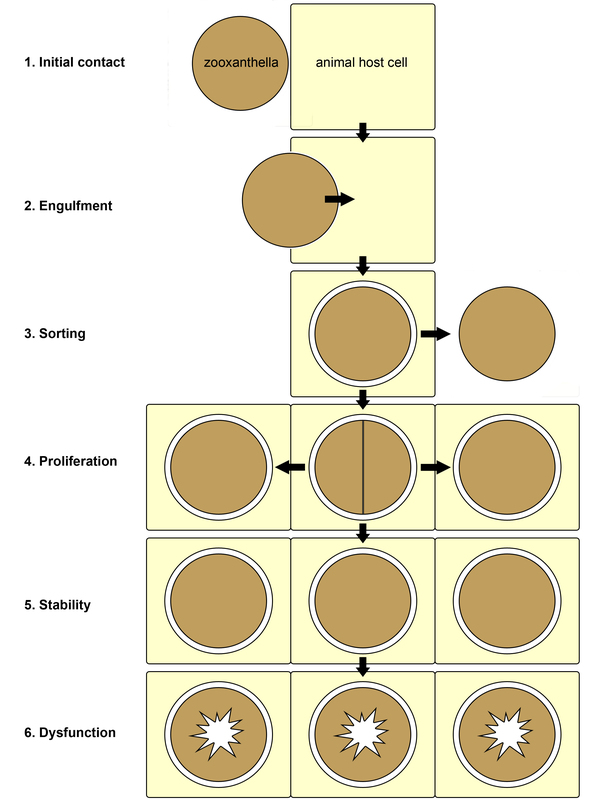 1: initial surface contact between the zooxanthella and animal host cell; 2: symbiont engulfment by the host cell; 3: sorting of the symbionts, now enclosed by a membrane of host origin, leading to rejection or acceptance of the symbiont; 4: growth of the symbiont via cell division within the host tissue; 5: stability, with a stable symbiont population; 6: dysfunction and breakdown of the symbiosis due to stress. Redrawn from Davy et al. (2012). Mechanism thought to underlie the coral-symbiosis breakdown. 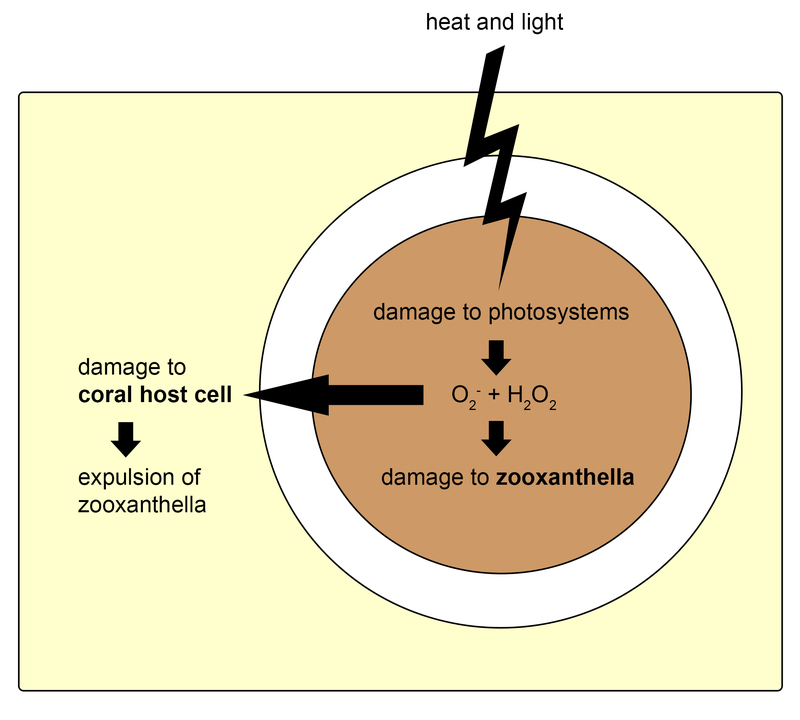 Heat and light stress cause damage to the photosystems within the zooxanthella, leading to the production of superoxygen radicals (O2–) and hydrogen peroxide (H2O2). This causes damage to the zooxanthella and the coral host cell, which triggers destruction and expulsion of the zooxanthella, and finally bleaching. Redrawn from Venn et al. (2008). Disruption of the animal-dinoflagellate symbiosis by environmental factors is nothing trivial. When corals are in a bleached state, they are no longer sustained by the vital nutrients from their zooxanthellae, and they have to reacquire their symbionts quickly to stay alive. Unfortunately, long, warm summers often prevent corals from doing just that, and massive coral mortality ensues. In aquaria, similar observations have been made. Many aquarists have seen the effects of heat and light stress at home, during warm summers or after the aquarium lights were upgraded. After several days of increased water temperature or light intensity, corals and anemones may bleach completely, resulting in a pale, colorless aquarium. It is therefore important to keep the aquarium temperature stable, and to increase light intensity slowly to allow the zooxanthellae to adapt. The sensitivity of zooxanthellae to heat and light stress is known to vary between clades, with clade D being the most heat-tolerant (Baker et al. 2004). This is possibly due to the fact that these zooxanthellae have photosynthetic membranes which remain stable even at temperatures around 93°F (32°C), and do not release toxic reactive oxygen species into coral tissue at this elevated temperature (Tchernov et al. 2004). This explains why some corals bleach during hot summers, and others do not. As long as the symbiosis between zooxanthellae and corals is intact, both partners benefit from an intricate exchange of nutrients. The coral cells provide the zooxanthellae with inorganic carbon and nitrogen (carbon dioxide, ammonium), produced by the breakdown of organic compounds obtained from the zooxanthellae (glycerol, glucose, amino acids, lipids) and the surrounding water (plankton, detritus, dissolved organic matter). The zooxanthellae, in turn, use inorganic compounds obtained from the coral and seawater (carbon dioxide, bicarbonate, ammonium, nitrate, hydrogen phosphate) to produce organic molecules through the process of photosynthesis. A major part of these organic molecules, now called photosynthates, is then transferred back to the host. This nutrient exchange between corals and zooxanthellae allows them to use the scarcely available nutrients in the ocean efficiently. The translocation of energy-rich compounds from zooxanthellae to their host has allowed corals to build vast reefs, through the secretion of calcium carbonate skeletons. It is clear that zooxanthellae do not simply transfer any excess substances to their coral host. The release of photosynthates from the zooxanthellae is cleverly induced by the coral with a so-called “host release factor”, or HRF. This HRF is a substance produced by the coral, possibly a cocktail of specific amino acids, which triggers the release of nutritious glycerol and glucose by the zooxanthellae (Gates et al. 1995; Wang and Douglas 1997). Indeed, when a drop of coral tissue slurry is added to a Symbiodinium culture, it will quickly induce nutrient release by the dinoflagellates (Trench 1971). However, Davy et al. (2012) point out that the HRF must not be generalized across host species, as evidence suggests that different species may use different types of HRF’s. Even though corals receive significant amounts of organic compounds from their zooxanthellae, research strongly suggests that an external food source is required to sustain optimal growth (reviewed by Houlbrèque and Ferrier-Pagès 2009). This is because corals require additional protein and lipid to grow tissue and the organic matrix, a proteinaceous “scaffold” that provides sites for calcium carbonate crystals to precipitate. Providing corals with a daily batch of zooplankton, such as copepods or brine shrimp nauplii, not only provides them with nourishment; the slight increase in inorganic nutrients will also feed the zooxanthellae. In addition, the cycling of nutrients within the symbiosis is stimulated. Some aquaria are so devoid of nutrients, owing to the use of heavy filtration combined with scarce feeding, that the zooxanthellae stop growing and die. This makes corals appear bleached, and when this occurs, it is essential that the filtration rate is reduced and/or feeding increased. 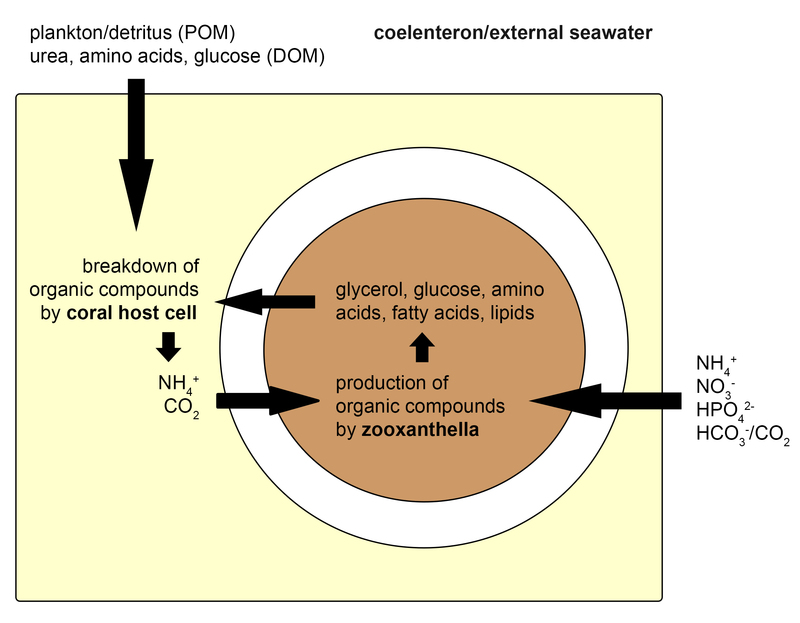 Overview of the nutrient exchange between a single coral and zooxanthella cell. The coral takes up organic compounds as plankton, detritus (or particulate Organic Matter, POM), urea, amino acids, and glucose (or Dissolved Organic Matter, DOM) from the seawater. In addition, it receives organic molecules from the zooxanthellae, such as glycerol. The coral cell breaks these down to ammonium and carbon dioxide, which are subsequently absorbed by the zooxanthella. The zooxanthella also takes up inorganic compounds from the water, as ammonium (NH4+), nitrate (NO3–), hydrogen phosphate (HPO42-), bicarbonate (HCO3–) and carbon dioxide (CO2), and converts these to organic molecules, mainly through photosynthesis. A major part of these compounds is again exuded into the coral host cell. This cycling of nutrients between coral host cells and their symbiotic zooxanthellae allows corals to grow in nutrient-poor environments. Redrawn from Davy et al. (2012). As zooxanthellae are essential to the existence of reef-building corals, it naturally follows that studying these dinoflagellates is important. To extract zooxanthellae, and thus valuable information from the coral, some equipment is required. The first step during isolation is weighing the coral, use the so-called buoyant weighing method. Each colony is weighed in seawater with a constant density (at a temperature of 26°C and salinity of 35 g L-1), by suspending it from a wire that is connected to a sensitive weighing scale. This is most accurate, as weighing above water would obscure the coral’s real air weight as a small layer of seawater would be attached to the coral. As each coral was weighed before and after it was glued onto a PVC plate, the net weight of the coral can be calculated when it is weighed again at any point in time, by simply subtracting the weight of the plate and epoxy resin. When the buoyant weight of the coral is known, the next step is removing tissue from the skeleton. With a fine jet of air, this is done easily. Small coral fragments (about 0.5-1 inches in size) are put in plastic tubes, and an air nozzle is inserted in the space between the tube and its cap. Depending on the coral’s morphology, the air jet is applied from 1 to 3 minutes, effectively removing all tissue. When the coral skeleton is completely bare, it is removed from the tube. The skeleton can be used itself for other types of analyses, such as determining the proteins that make up the organic matrix. After the tissue has been separated from the skeleton, artificial seawater is added, and the tube is shaken until a tissue suspension is obtained. With a centrifuge, coral tissue and zooxanthellae are then separated. The zooxanthellae are heavier and will sink to the bottom of the tube, creating a brownish pellet. 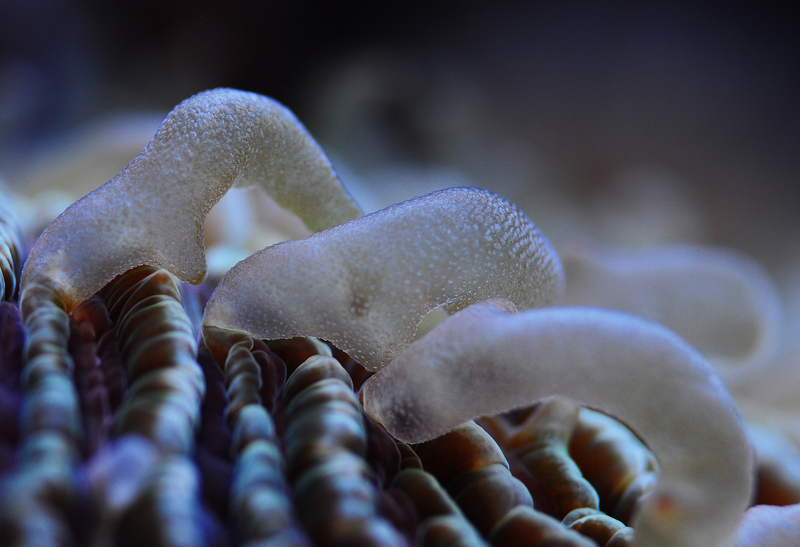 The coral tissue forms a slightly opaque solution above the pellet, called a supernatant. This supernatant can be removed with a pipette, or poured, and the zooxanthellae pellet can be resuspended in seawater. Both fractions can be analyzed for enzymatic activity, protein content, or even DNA. The zooxanthellae fraction can also be used to establish live cultures of free-living dinoflagellates for research. To obtain the zooxanthellae density in the coral, a small volume from the zooxanthellae suspension is applied on a haemocytometer with a pipette. A haemocytometer is a small chamber which contains a counting grid, and is also used to count bacteria, algae and blood cells. Under a microscope, the amount of zooxanthellae per unit of sample volume is then determined. Because the total sample volume is known, the total amount of zooxanthellae isolated from a piece of coral can be calculated. By dividing this number by the weight (or surface area) of the coral, the zooxanthellae density is obtained. This method allows researchers to find out how the growth of zooxanthellae is affected by the coral’s environment. With some basic laboratory equipment, zooxanthellae can even be isolated at home. A coral is suspended from a wire for underwater, or buoyant, weighing. With pressurized air, coral tissue can be effectively removed from the skeleton. A centrifuge allows for separation of coral tissue and symbiotic zooxanthellae. Important tools of the trade: a pipette, tips and a haemocytometer. 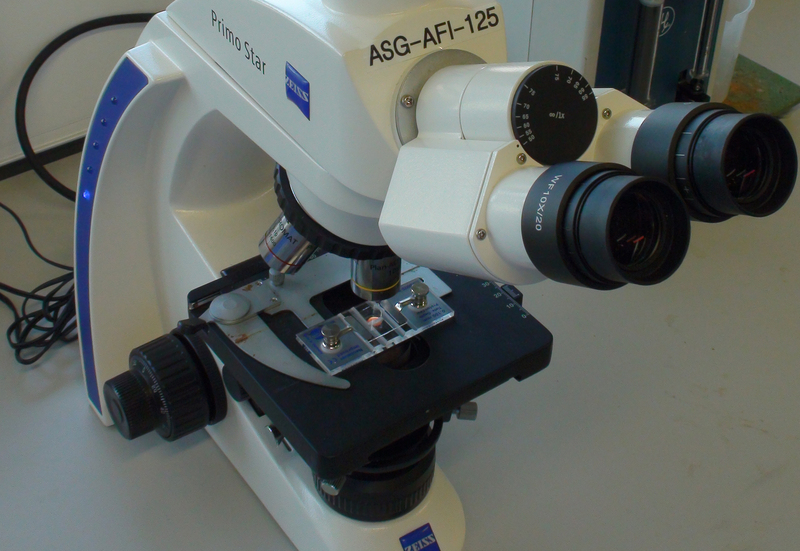 The haemocytometer is placed under a microscope to determine the zooxanthellae density in the coral tissue sample. First described by Brandt in 1881: zooxanthellae. Here, they have been isolated from the reef coral Stylophora pistillata. Magnification is 100x (excluding camera zoom). Even though quite a lot is known about zooxanthellae, many future avenues of research exist. These are focused on understanding more about the onset and breakdown of the symbiosis between corals and zooxanthellae. By now, it is clear that the world’s reefs are deteriorating, and the fragile coral-zooxanthellae symbiosis lies at the heart of this issue. Factors which determine the sensitivity of zooxanthellae and corals to stressful conditions, such as high water temperatures, will remain a subject of thorough scientific study. Of major interest are so-called interactive effects, where the interplay between e.g. water temperature, pH, light intensity and nutrients determines coral bleaching. 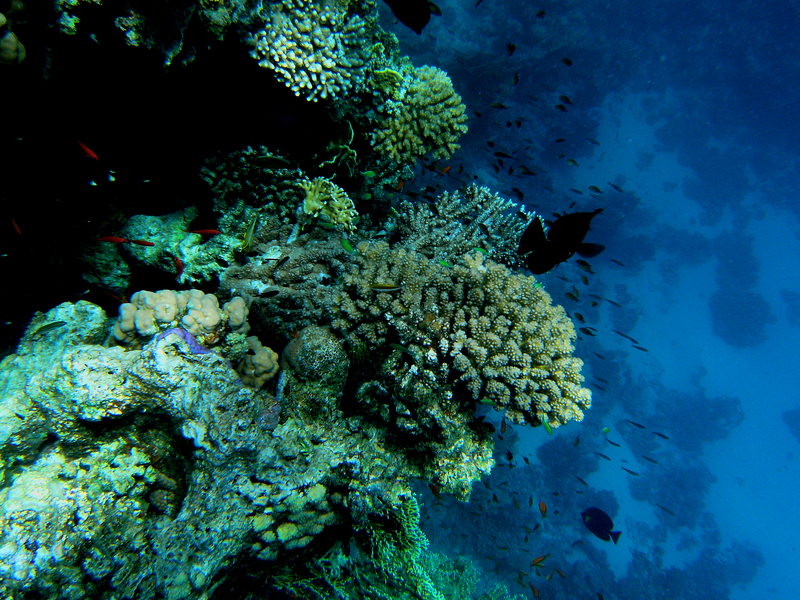 Coral reefs (here at Ra’s Qul`an, Egypt) are quickly deteriorating, and the symbiosis between corals and zooxanthellae lies at the heart of this issue. The next time you gaze at your corals through the aquarium glass, think about the intricate, delicate partnership they have formed with zooxanthellae, how this allows them to build the largest natural structures on earth, and how easily their alliance with zooxanthellae fails if environmental conditions are unfavorable.